Home » Appliqué » Catching up, at least trying to! It will be interesting how the rest of 2019 goes! For the last two and a half months, I have been so busy taking care of my husband after his knee replacement surgery in mid-December that everything else was put on hold. I finally decided to make it a point to at least catch up on the Block of the Month because if I didn’t, I would be trying to catch up in 2020! So besides the BOM, all I have to share with you this month is a knitted vest I have been TRYING to finish, but keep ripping it out, because I am making it up as I go! It is a UFO that I should have been finished by now since I started it in November. More about that below. The Block of the Month this year should really be called Wallhanging of the Season, a little different approach and definitely ambitious. It is called Through the Seasons. 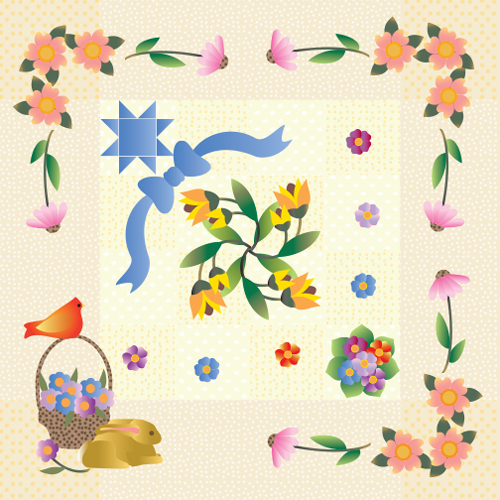 Instead of a block, you will be given one part of the wallhanging each month for three months. There are four, of course, one each for Spring, Summer, Fall, and Winter. Here is Spring Fling. Each season will be available for three months. One portion will be presented each month, it starts with the center. Since I got a late start, Spring Fling will be available until the end of April. Then the pattern will go to Payhip. I need to get back to the Floral Alphabet Garden borders too before my appliqué fingers get rusty! Have you ever wished you could clone yourself to get everything done? Where are Santa’s elves when you need them? Now back to the vest. Bottom line it hasn’t been finished because I have been doing all the driving and extra household chores that I don’t normally do. Like hauling firewood since that is our main way of heating our house. That is something that my husband does and keeps the piles well stocked all winter. Seven acres of forest gives us quite a bit of firewood. So my time to do my handwork has been severely curtailed! 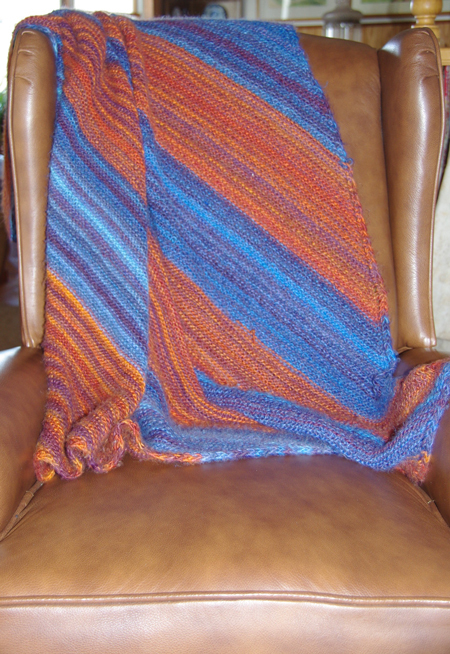 The variegated yarn was purchased about 4 or 5 years ago. I started knitting it, in the round, because that avoids seaming, here are some vests I have made that way. However, once I started I didn’t like the stripes going around my body, so I thought I would knit vertically. Not a good idea either, so all that was left to do was knit diagonally! 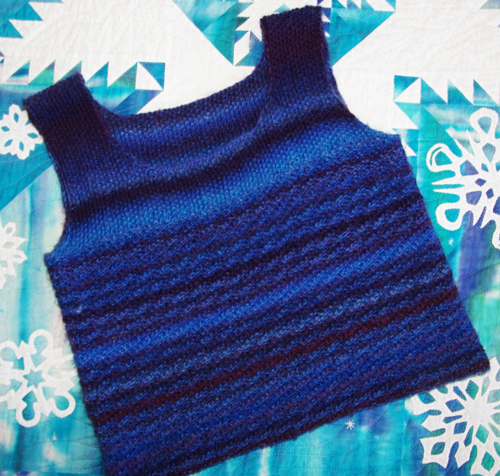 However, since the vest is knitted diagonally, it has to be knit in four parts. Is there a way to do that in the round or make fewer pieces? I couldn’t find a technique if there is one. If you know of one please share it with us! Getting the neckline and armholes in the right places and sizes was another problem! Although I think I finally have it figured out. The one on the left is correct and the one on the right is wrong because I made the neck too deep and the armhole too shallow. 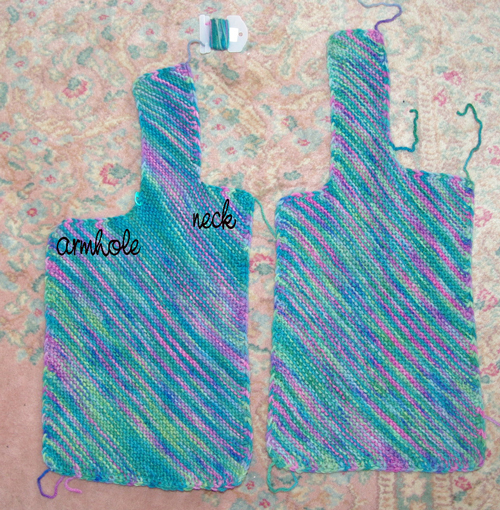 My friend Anne showed me how to make knitted dishcloths diagonally. So I knitted a blanket diagonally from variegated yarn that again shouldn’t have been knitted in the round in the first place. Unknitted this vest to make the blanket. Unknitting goes much faster than knitting! Much nicer as a blanket than a vest. Use it up and move it out, that is my goal! It has been fun trying to figure it out how to knit the vest diagonally. The directions will be posted once I nail them down! I am looking forward to your finished vest and directions. Haven’t tried diagonal much, but I like the idea. I am hoping to finish it soon! The directions are being written and rewritten as I go! Dear Barbara, may I suggest you get a nice 11th or 12th grade senior to haul the wood for you? Some things are better paid for than risk injury when one is taking care of another. Love the vest you’re making. I, myself, can’t knit (too tight) but I do crochet. That’s a darling blog you’ve come up with. Stay warm. Angie that is so sweet! We did get some young friends to actually stack the wood for us, that left it to me to actually bring in a bucket of wood as needed. That is the easy part. My husband is now up to doing that, so we take turns. I don’t crochet, because I end up with a beanie, no matter what I am making!